San Diego » Blog » Water Damage Restoration » When it’s Raining Cats and Dogs in your Home, don’t Step in a Poodle! Friedrich Nietzsche wrote that out of chaos comes order, and nothing quite sets the stage for a chaotic visual than coming home to a leaking roof or a burst pipe. But when homeowners stay calm and “stop, think and act”, they can take the necessary steps to help protect their home from further damage while waiting for the water damage restoration company to arrive. In the terrible event you come home to discover a flooded basement or leaking roof, be sure to follow these steps that will enable you to pitch those watery cats and dogs right out your door! The first thing you will want to do is call a water damage restoration company to come out immediately. The most reputable water damage crews will arrive on site within 45 minutes of your call and offer a free inspection and estimate before getting to work. 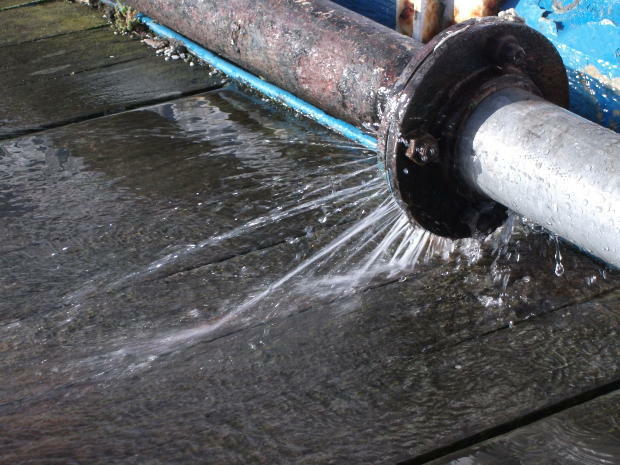 While waiting for the water extraction professionals to arrive you can begin the cleanup process yourself and help prevent additional damage. But the first step is to make sure the home is a safe place for you and your family members. Unplug all electrical equipment and appliances in the flooded areas before you start trying to remove water and salvage your possessions. This will help prevent electrical shock or flying sparks that may start a fire should they land on a dry area with flammable textiles or other vulnerable materials. You will want to spend the next 30-45 minutes removing as much water as possible until the pros arrive. Have all capable family members gather buckets or containers to fill with flood water. When you dump the water outside make sure to do so far enough away from the home to avoid pooling water that may soak down into the foundation and cause mold and rot. Also, remember that while we like to think of water being light, when gathered in a receptacle water can become rather heavy. Instead of filling a large bucket with water and wasting time and risking injury to slowly maneuver out the door, use smaller buckets to fill with H20. They will weigh less and allow you to make more frequent trips while minimizing your risk for muscle strain or a stumble. While some family members begin the water cleanup process, appoint one or two people to gather all wet items in the home and take them outdoors to a dry area. If it is raining outside these items could be stored in the garage. Leaving wet objects in the home will allow moisture levels to increase. Also, be sure to move any dry items that are being threatened by nearby water leaks to a safe area free from the threat of falling or pooling water. If you have pets be sure to sequester them to a room that is not under threat from water damage. Pets, especially dogs, may find the chaos of the situation to be exciting and they might decide to jump in the water or run wildly about making matters worse. It is also a good idea to lock pets away to protect them from harm. Until a water damage team can inspect for mold and other harmful bacteria that may have found its way into the flood water, pets should be stationed off on the sidelines. A flooded home is a lot like a victim receiving CPR. When you perform life-saving actions on an individual, you will want to note as many details as possible to share with paramedics upon their arrival. Taking note of the actions you perform in water cleanup and removal is just as advantageous; as it will give the water damage restoration team a good idea regarding the extent of the situation. Just remember that when water catastrophes strike your home and those cats and dogs are raining down, stay sharp and act quickly. You have the power to make a difference before the real professionals show up!